Indie rock group The National had a bit of a disaster on its hands at a show in Chicago last night. Apparently the band had to repeatedly stop its concert to answer questions from a fourth-grade class that was supposed to interview an adult about their job. Yikes. Sounds like those guys totally cracked under the pressure of a gang of pushy students. According to concertgoers, The National had just launched into the introduction of its hit song “I Need My Girl” when all 23 students from Mrs. Summerfield’s fourth-grade class wandered onto the stage carrying notebooks and pencils, bringing the concert to an immediate halt. The sold-out crowd of 3,000 fans had no choice but to sit and wait it out while each of the kids asked the members of The National a long string of questions about life as professional musicians that they had handwritten on 3-by-5 college-ruled note cards. The whole situation completely devolved from there. 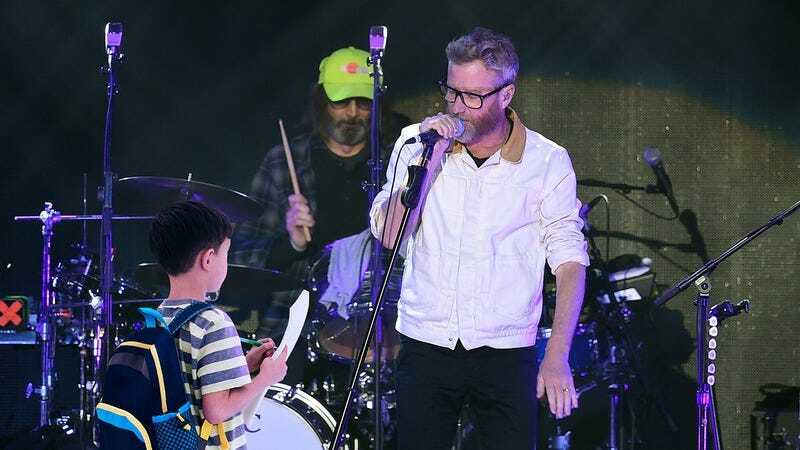 Every time The National attempted to resume its concert, one of the kids onstage would raise their hand and the whole band would stop playing to field their questions. To make matters worse, the 9- and 10-year-old students didn’t even ask anything interesting. Instead, they threw out inane questions like “Do you like to be in a band?” and “Does it take a long time to drive to work?” Audience members say that The National had to stop 10 or 11 times during each song to answer a new question from these kids so they could complete their assignment. Wow. This sounds like the kind of humiliating screwup the members of The National would like to forget, and based on the quality of these questions, these kids are about to turn in some truly mind-numbing essays about what it’s like to have a job as a musician. Hopefully, The National is able to bounce back quickly from this disastrous concert and take steps to make sure something like this doesn’t derail any more performances in the future.